Here is a sneak peek at the new Clue: Secrets & Spies badge called "Going Deep" and it will be available very soon. - the chat to be on the side of the game, not below the game as it is in the new HTML 5 games. - using the badge icon in chat rather than a Mini. Ooooo, I love it. Nice badge. SCUBA divers rock. Yeah, Pogo seems to be coming out with some great looking badges lately. I also like the new badge. Pogo will be releasing World Class Solitaire HTML 5 in the next couple of months. - The Flash version of World Class Solitaire will be upgraded to the NEW World Class Solitaire HTML 5 game within the coming months. - All unfinished, activated Badges from the Flash version of World Class Solitaire will be auto-awarded to your account on a date yet to be determined. - All Badges purchased (both activated and not activated) for the Flash World Class Solitaire will be auto-awarded to your account on another date yet to be determined. Thanks for the heads up! Suggestion to all those who have not ranked out in WCS: rank out in it if you want rank badges. When the new H-5 version comes along, there will be another set of rank badges, and the old ones won't be available. Yes, now is the time to rank out. We have a couple of months, so there is plenty of time. New "January Freeze" mini items will be added to the mini mall this Thursday, January 18th. - First badge marathon for 2018 starts this Friday, January 19th in Pogo Sudoku, Aces Up HD, Jewel Academy and Jet Set Solitaire. - Pogo is looking into compensation for the power-ups players used in Monday's Mahjong Escape daily challenge. - Jewel Academy is getting 40 new levels at the end of January, Cookie Connect is getting 40 new levels in February. - World Class Solitaire and Crossword Cove will be converted to HTML5. - New HOG game called "Vanishing Trail". - New word game called "A Way with Words". Here is more information on the badge marathon that starts this Friday. Club Pogo Members, a new Badge Marathon is almost here. This Friday, we'll be gifting you eight badges for four of Pogo's newest games. You'll have until Thursday, January 25 at 11:59 pm PT to complete all eight to win a bonus Badge. Even if you don't complete them before then, you'll still have eight new Challenges and Badges to enjoy. Here is a sneak peek at the new Scrapbook badge called "Hop Around Kid" for First Class Solitaire. For our second Scrapbook Badge, our main character is a little older. 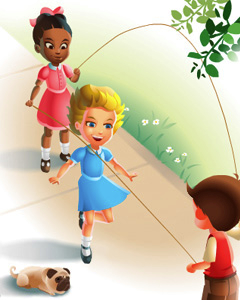 She's playing Double Dutch with her friends on a summer's day. We tried to inject some Norman Rockwell into the art by using some white space to highlight the characters. It gives the badge a nice classic look. Crossword Cove : Just starting to think about the transfer of it from Flash to H5. No date or other information at this time. Yeah, they are really stepping up their game. It also looks like a lot of stuff is coming up soon! Also in their latest blog post, they addressed why it's not possible to transfer ranks and badges from Java & Flash to HTML 5. A. Many of you have expressed concern over ranks not transferring over to the new H5 version of the games. Thank you for asking and I hope to help answer for you. The reasons the ranks are unable to transfer over is because it's technically not possible. To get a little technical here, the backend code of the Flash and Java games are the same, but when moving over to HTML 5, that code is very different. But, this also means you get to start over with the new version of the game and work the new ranks. It's a new game with new beginnings which includes new rank badges. As for the badges, we're investigating options with the new technology. I will keep you posted with any developments that we might have. Ok. I would get ticked off if the old badges were lost but they are still part of the total count. Yeah, I believe the old badges will still be there and count towards your total. Pogo will be releasing Turbo 21 HTML 5 in the next couple of months. Coming Soon: Turbo 21 HTML 5! I have an update for you! The Pogo Team has been working hard to upgrade another game for you. In the next few months, Turbo 21 HTML 5 will be up and available for all to play! While we do not yet have a release date, we did want to let you know ahead of time so you can prepare. - The Java version of Turbo 21 will be upgraded to the NEW Turbo 21 HTML 5 game within the coming months. - All unfinished, activated Badges from the Java version of Turbo 21 will be auto-awarded to your account on a date yet to be determined. - All Badges purchased (both activated and not activated) for the Java Turbo 21 will be auto-awarded to your account on another date yet to be determined. - Unfinished Rank Badges will not be transferred over. Because this is a new version of the game, it will come with its own Rank Badges. All finished Rank Badges will be yours to keep in your Badge Collection, too. I will keep you posted on when Turbo 21 HTML 5 will be released and when we have more information about the Badge awarding! Thank you for your patience.